1. 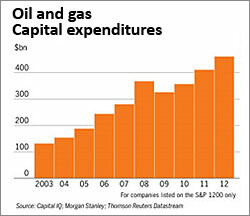 Costs of Exploration Skyrocket: Capital expenditures for oil and gas exploration and development have skyrocketed over the last decade. Unfortunately, as the International Energy Agency pointed out in a report they issued last month, the reserves and production that are being discovered from the increased capital expenditures have been disappointing. New reserves are becoming harder to find and more expensive to develop. Many of these reserves — the horizontally drilled shale formations, Canadian tar sands, and deep ocean exploration prospects — are much costlier than conventional reserves to develop. As a result higher energy prices are required to sustain the exploration and development activity. The Wall Street Journal published an article that discussed the diminishing returns on capital investment in the energy sector last month, especially for the larger companies who need to make massive investments to make significant changes to their reserves or production. Chart courtesy the Wall Street Journal. From an investment standpoint energy service companies should benefit from the increasing capital expenditures, as well as small to midsize energy firms with proved conventional reserves in the ground in politically secure areas of the world. 2. Record Global Demand: The International Energy Agency, the Energy Information Administration, as well as OPEC forecast that global crude oil demand will continue to increase in 2014. The agencies expect demand to grow by roughly one million barrels per day in a market that consumes roughly 90 million barrels per day. 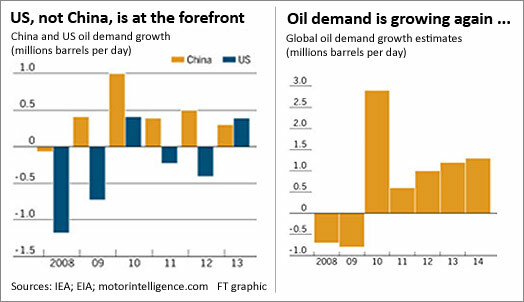 Global demand growth has been relentless, and has closely correlated with economic growth. The interesting development in the oil demand growth story is that more of the demand growth in 2014 is expected to come from the United States and developed economies. Several years ago some analysts made the argument that we had seen "peak demand" for crude oil in the developed economies (which included the United States, Europe and Japan). That argument does not appear to be supported by the recent consumption data. A fact the investment community is overlooking is the fact that the shale drilling revolution in the U.S. is discovering lots of liquids — but much of these are natural gas liquids and not crude oil. For practical purposes the global supply of crude oil has grown at a much slower pace if at all. Natural gas liquids are counted as crude oil by the forecasters, but only contain around 70% of the heating content. There are limits on the use of these liquids as refinery or petrochemical feedstocks. While the developed economies continue to become more energy efficient, especially in the transportation fleet, the demand growth continues. From an investment standpoint proved reserves in the ground should remain a very attractive asset. 3. Brutal Cold Drives Natural Gas Demand: Beginning in early December long term weather forecasting models turned brutally cold for the U.S. Northern Plains, Midwest, and Northeast. 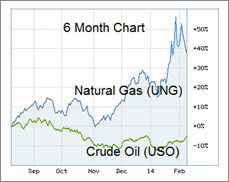 As a result of the cold the consumption of natural gas has reached record levels. Three of the largest weekly draws of natural gas from storage in the last twenty years has occurred this heating season as can be seen in the table of EIA data below. 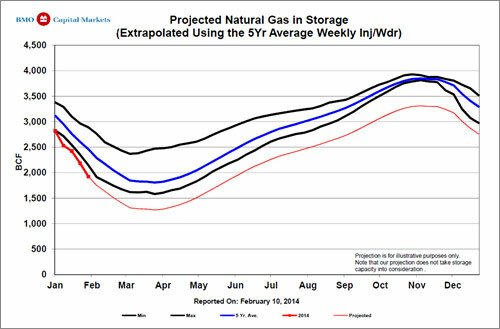 Week after week we have been seeing withdrawals from natural gas storage well above five-year averages. While U.S. natural gas production has increased by 25% in the past six years demand has also increased in the industrial, electrical generation, and petrochemical sectors — in addition to the increased use of natural gas for space heating in the growing residential and commercial sectors. Chart courtesy Financial Times. In addition to heating, for environmental reasons natural gas is taking a larger share of the electrical generation load that historically has been dominated by coal burning generation units, adding to demand. 4. Propane & Heating Oil Shortages: Propane shortages have been an increasingly common problem in the Northern Plains and Midwest this winter. Corn farmers used much more propane than normal to dry their wet crop this fall, leaving local inventories relatively low moving into the winter months. Rural houses not on a natural gas distribution system are commonly heated with propane, and farmers and ranchers raising livestock or poultry also heat their animal facilities with the fuel. 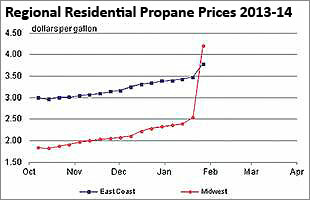 Due to the robust demand from the extreme weather, and the lower supplies, propane prices have spiked upward in many local markets. Chart above courtesy Tim Hodge of the Columbia Daily Herald. 5. Record Natural Gas Draws: Natural gas storage levels, especially in the Eastern region of the U.S., are forecast to reach extremely low levels as they continue to be drawn down with the winter weather. Higher prices, at least locally, will be needed to ration demand. At season end these storage reservoirs will come very close to the practical minimum working gas levels that are needed to sustain the operation of the delivery systems. While the Eastern storage draw-downs have been much more intense than the Western draws due to the cold weather, the storage picture in general for the U.S. points a modestly bullish (some might say a strikingly bullish) case for higher natural gas prices. 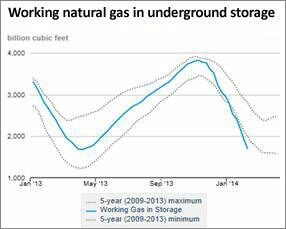 Chart below of total working gas in storage from all regions provided by EIA. Longer term forecasts indicate the cold pattern may moderate for a week toward late February, especially in the west, but will remain in place into March for the Midwest and Northeast. Due to the extreme cold the Great Lakes have the most ice cover in place in the last 20 years — and snow cover is also the highest in a decade - which tends to allow colder arctic air to invade the U.S. without the temperature being moderated by the open water. 7. Deliverability Bottlenecks: Recent spikes in natural gas prices in New York reported by Bloomberg illustrates the distribution system bottlenecks that have arisen as gas consumption increases. While the Northeast traditionally relied on heating oil, for economic reasons natural gas has made large inroads in the heating market in the last decade. While total supplies of natural gas available to meet market demands should be adequate, the infrastructure to store and delver such gas at times of peak demand will need to be substantially upgraded and expanded. Short term, news of shortages and price spikes at the city gate of major consuming areas may generate investor interest. 8. New Emission Regulations: The EPA’s new Mercury and Air Toxics Standards (MATS) currently being implemented is forecast to cause roughly 15% of the U.S. coal fired generation plants to close in the next year. While many of these plants are older and have reached their economic limits, new plant permitting and design requirements strongly encourage utilities to utilize natural gas as the fuel source for their base load. Wind and solar power are too intermittent to be reliable, and the recent natural gas price deck has made natural gas the fuel of choice. In periods of high natural gas demand due to the weather, high demands for electrical generation might have unexpected impacts on the total demand (and hence pricing) of natural gas in the years ahead. What has happened to demand in the face of the severe cold may not be entirely a weather driven event. 9. Production Decline Curves: Decline curves for shale wells continue to be much steeper than conventional wells, which means that drilling needs to continue at a robust pace to maintain production and deliverability levels. Should drilling slow, the impact should quickly appear in production levels. 10. Natural Gas Needed to Refill Storage will Set Records: BMO Capital Markets published an interesting chart of where storage will be next November (the end of refill season) if the volumes of natural gas injected into storage were identical to the five year average. 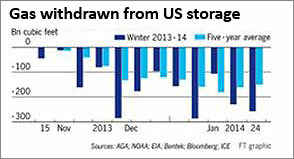 Storage would be grossly short heading into the winter season — somewhere around 3,300 Bcf. Companies will do what it takes to get storage filled to 3,800 Bcf to insure they have the gas for delivery next winter. The implications are that demand will be higher, and if supply remains roughly at last year’s level reasonably higher natural gas prices might be needed to insure supplies. 11. Natural Gas Prices are Outperforming Oil: Due to the surprising high demand for natural gas this winter natural gas prices have begun to outperform crude oil prices on a relative basis. While crude oil prices have held roughly steady over the last six months natural gas prices have improved significantly on the spot market. With the cost of propane doubling in some markets and heating oil also seeing hefty increases, combined with the need to use much more of the products for heating, we expect the average consumer to experience a relatively large impact to their discretionary income. Add in higher electricity costs driven by natural gas fuel charges, and the cost of snow and ice removal, and consumer spending could be lower than expected this spring and summer. Business costs should also increase. Depending on the energy intensity of the business the cost increase might be substantial. Companies that provide services to the exploration and production sector, as well as to the refining and petrochemical sectors, should prosper from the additional capital expenditures being spend on exploration. As coal fired electrical generation units are either retired or retrofitted to meet new EPA emission standards natural gas demand should continue to increase. Marginally higher natural gas prices may make retrofitting older coal units more attractive than building new natural gas generating stations. Companies providing pollution control equipment should do well. Companies with proved reserves of natural gas or crude oil in politically secure areas should benefit from the increasing demand for the fuels.